Capgemini and LinkedIn have published a report summarized in this article at Diginomica.com. The article says that employers must up their game to attract, develop and keep digital talent. This article is written through the lens of HR. That’s fine and dandy, but I want to address the seriousness of the digital skills gap from the Sales lens. According to Pew Research, millennials have surpassed Gen Xers in the U.S. labor force. Non-millennials often lack digital skills putting them at a disadvantage. This is exacerbated in B2B sales when experienced reps with successful track records hit roadblocks in reaching buyers because, unlike in years past buyers are now in control. The modern buyer is digital and hard to reach..And, even harder to engage in sales conversations. Also consider that with millennials making up more than 30% of the U.S. workforce, many are in influential buying roles. To engage them in a relevant manner, the digital skills gap must be addressed in sales. It’s only logical that if the modern buyer is digital, then the modern seller must likewise be digital. But, acquiring digital skills is often overlooked or undervalued. The modern buyer doesn’t permit being sold to on digital channels. Rather, the modern buyer needs help in solving business problems. The digital skills gap many B2B sales teams face is that sales reps aren’t enabled with the mindset, skillset and toolset to meet the needs of the modern buyer. 55% of respondents say they will move to another job if they feel their current employer is not doing enough to keep their digital skills current. 58% say they will gravitate towards companies that offer better digital skills development. What’s so compelling about these two data points is that they run counter to a common fear that sales leaders have. Often sales leaders fear that by training their sales team on digital skills they’ll accelerate their departure to another company. In fact, the opposite is true. 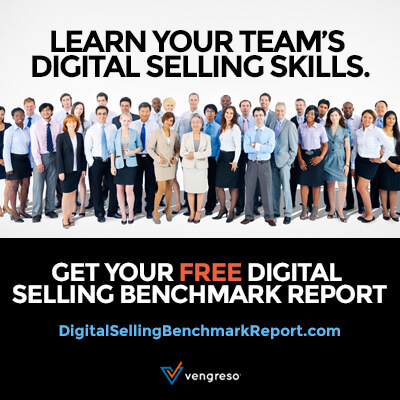 By improving digital selling skills, reps gain more confidence because they are able to build thought leadership and credibility with prospective buyers. A recent Edelman Research study shows that thought leadership really does impact sales. Admittedly, I’m going to over simplify the issue because this is a blog post, not a book. It starts with acknowledging the truth as explained in the recent studies linked up here. Sales leaders must invest in developing the mindset and skillset of digital selling as well as to provide the toolset to enable productive engagement and measurement of success factors. Sales reps are driven by winning. Being disadvantaged due to a lack of digital skills is a serious impediment to winning and leads to frustration, failure and turnover. The issue is a strategic one that requires attention at the highest level of the sales organization. Sales leaders are not immune to the digital skills gap. Some sales leaders are millennials, but many are not. Sales 101 has always taught to understand your buyer and solve her problems. This sales 101 principle will live on forever. The “how” of reaching and engaging the buyer to solve her problems will always evolve. Addressing the digital sales skills gap is a big step in the right direction to becoming the modern seller that the modern buyer requires, which leads to winning more sales.